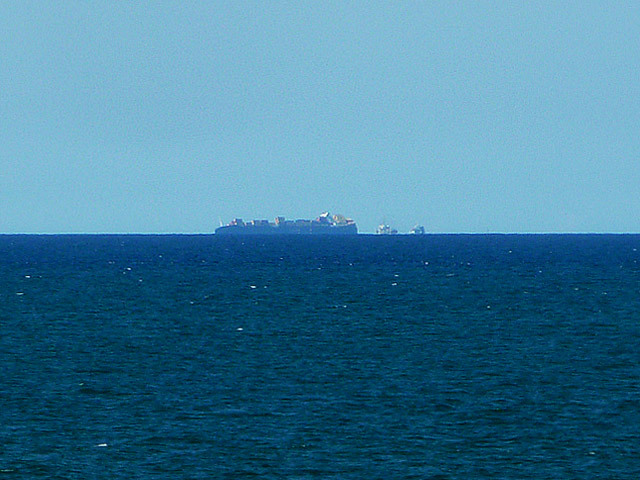 On the 5th of October the container ship Rena ran aground on Astrolabe reef, it is stacked full of cargo, packed full of fuel, a month later it is still there. 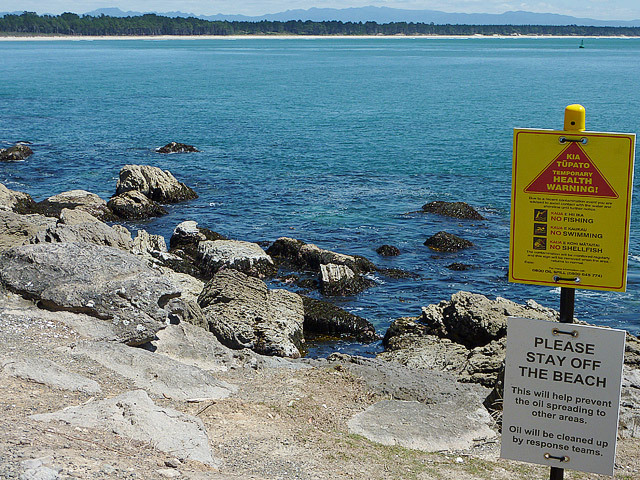 The reef is 22 km from the coast in a direct line from Papamoa Beach, the hub of the Western Bay of Plenty. The wreck is just visible from the beach, at night lit with powerful lights, Rena and her salvage craft are a pretty sight, by day an ominous shadow, slowly discharging fuel and cargo, a split in it’s side threatening to break the ship apart. I have spent a number of days at Papamoa recently, staying with my father at the family home. When we moved to Papamoa Beach from Rotorua more than 35 years ago, it was an isolated and unpopulated stretch of seemingly endless beach. Back then the mail was delivered by Rural Delivery, the address was linked to the nearby orchard service-town of Te Puke. 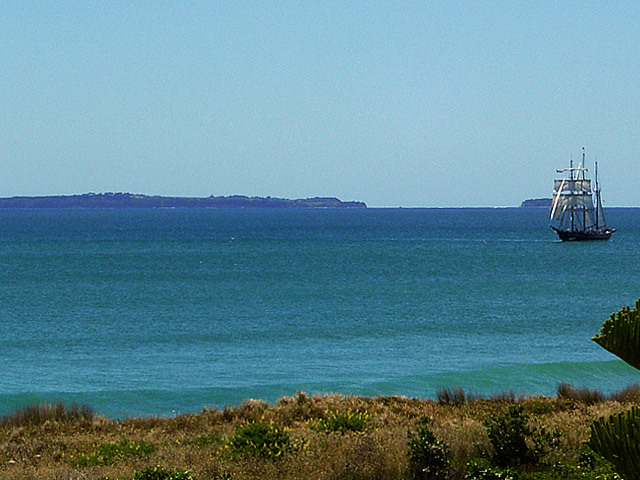 Papamoa has since become a town of 20,000 residents; a town with its own address. 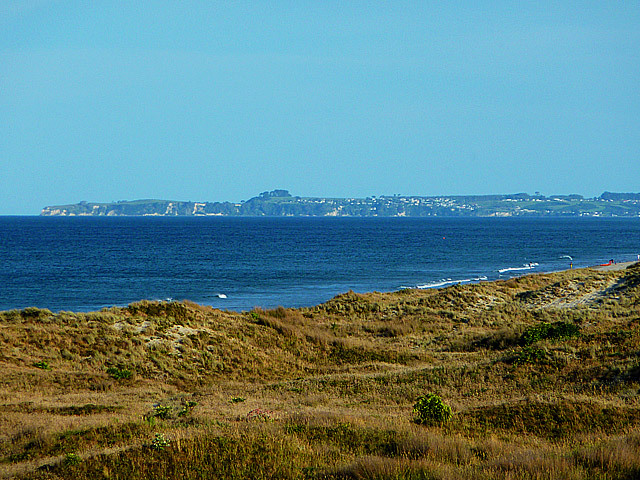 Looking north to south along the horseshoe shaped Bay of Plenty, the Coromandel Ranges march north, the East Cape stretches south. 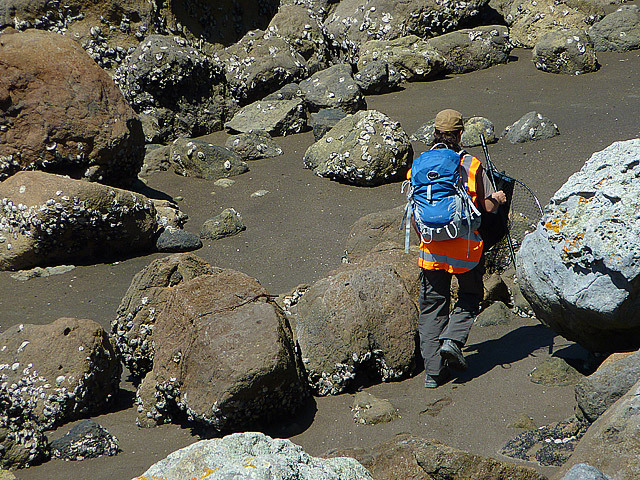 Despite covering hundreds of pacific ocean miles, on any clear day the islands of the Bay are visibly numerous; from the southern actively volcanic White Island (Whakaari), to the northern gang of The Aldermens group. 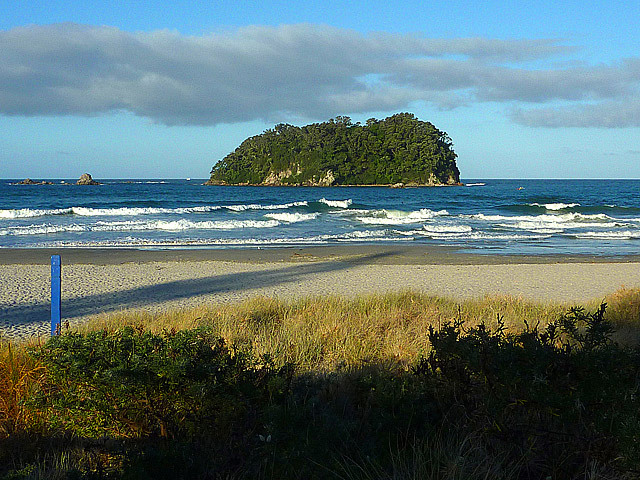 Look south for Whakatane’s Moutohora (Whale) Island, and our own Motiti Island with its sibling Taumaihi (Plate) Island. 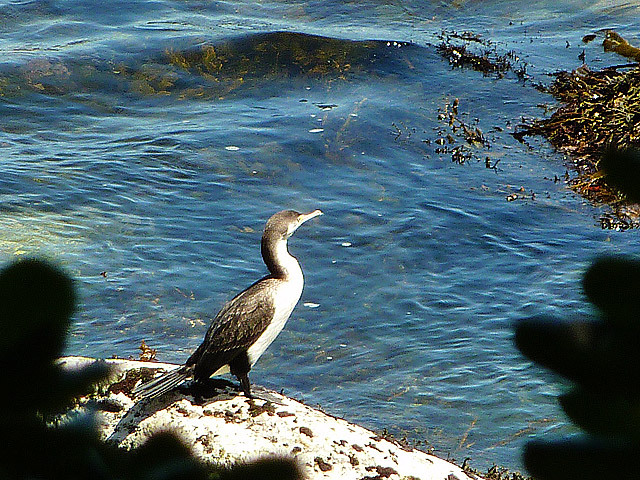 Taking centre stage in the Bay is the wildlife sanctuary of Tuhua (Mayor) Island. 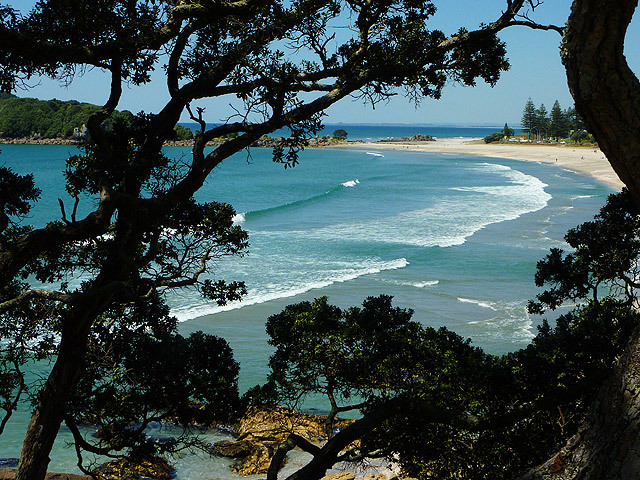 Look north-east for Mount Maunganui’s Motuotau (Rabbit) and Moturiki (Blowhole) Islands. On the landward-side, Matakana Island may barely rise above sea-level but it’s enough to protect the harbour entrance and its upper-reaches. With the northern Slipper (Face) Island and its familial Penguin and Rabbit Islands, Shoe Island and its attendant Big King and Little King Rocks, Bay of Plenty waters merge with those of the Coromandel. 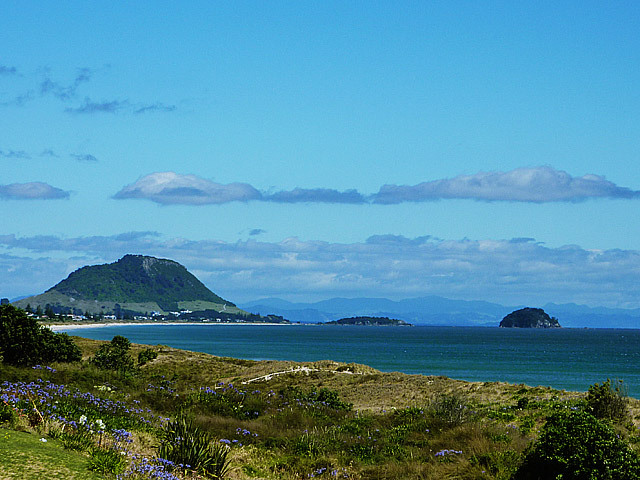 Maoua (Mount Maunganui) is its sentinel star however, once a volcano, this hardened plug is all that remains after the outer slopes and peak weathered away. Connected to the mainland by a convenient sand spit, it has always seemed to me just a giant storm away from returning to an island itself. A local fisherman told me about his favourite fishing spot off Papamoa Beach, further down from us at the Domain, he calls it ‘Green Hill.’ Made of Papa rock, about 22m below the surface and four kilometres from shore, it is only two meters in circumference and barely rises off the sea-floor, yet a horse mussel bed clings to its edge in profusion and terakihi swirl around it by the hundreds, stacked up like planes waiting to land at a busy airport. Brewers Shoal is another favourite, just out from Motiti Road, made of solid rock and bigger in area than ‘Green Hill’ it magnetically attracts many fish species in large numbers. Further down the coast at the ‘Cut’ – where the Kaituna River enters the sea – he has caught kahawia and trout (and put the trout back) in the same spot at the river mouth. In my late teens I fished from a dingy, rowing up to 4 km or more from shore in a direct line toward Astrolabe, the closer I got to the reef the better the catch; snapper, gurnard, kahawai, trevally, even the esteemed john dory. Occasionally while pulling in a catch it would be stolen by an apparent flash of light – sharks or kingfish – taking hook, line and sinker. Sting rays with wings four or more feet wide disturbed the sandy seabed below, clearly visible in 20-30m of water, occasionally one would leap out of the water, glide through the air and cleanly return with hardly a splash. Orca in a pod of 30 or more would cruise by, calves sticking to mother’s side, emulating their every move as they chased schools of fish, mouths agape. Dolphins zig-zaged from the open-sea to the inshore surf at phenomenal speeds, disturbing schools of fish and scavenging seagulls like children charging grounded pigeons. 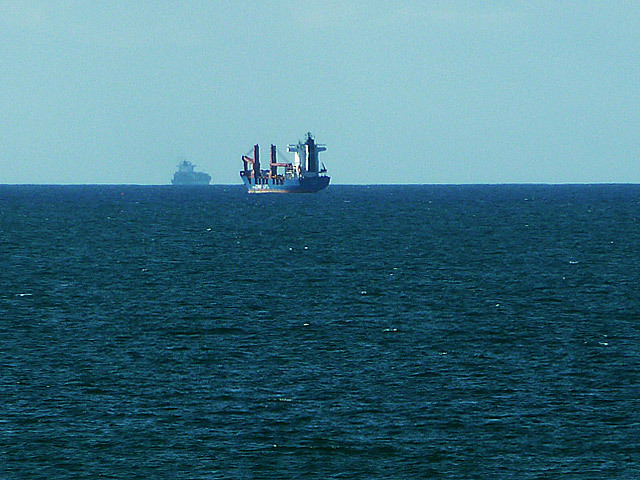 Growing up with the beach as our front-yard we saw hundreds of ships cross the Bay of Plenty horizon, a few hours later they would be anchored in the roadstead awaiting their turn for the Pilot-boat and Pilot to guide then into the Mount Maunganui Port. Today it is known as the Ports of Tauranga, grown to occupy both the Mount and Tauranga sides of the inner harbour. I have never seen a ship take the course of the Rena, from a distance they always seem to hug Tahua, not Motiti. Following the grounding, the first four days saw fine weather, calm seas and mild breezes, in all appearances Rena sat calmly, half on the peak of Astrolabe, half hanging over the deep. A split widened through her hull however, following some unsettled weather oil drifted toward the beaches. 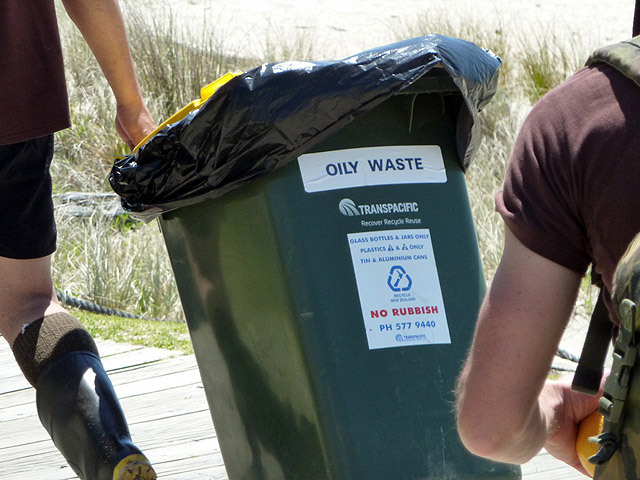 As the week unfolded Papamoa locals tell me they new oil had arrived at the beach, there was no need to see it, the smell was horrendous; like diesel but ten times stronger. 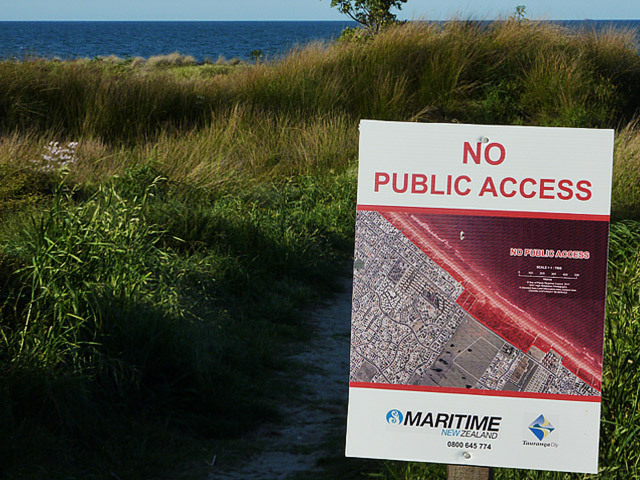 It was to become overwhelming – even in the suburbs a kilometre and more inland – the stench enriched when containers disgorged processed meat on to the beach. 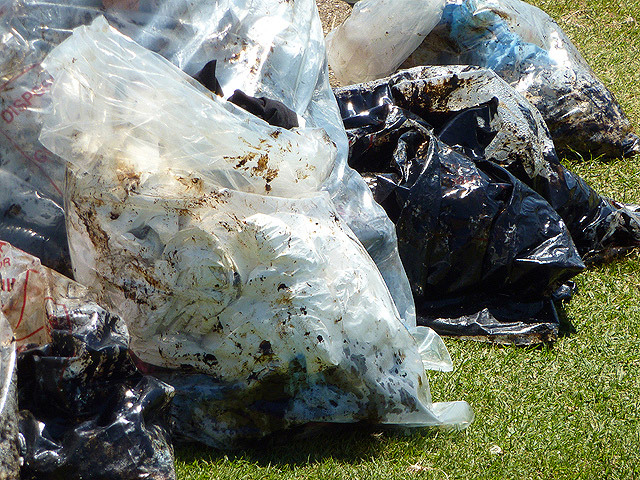 Birds and fish caught in the drifting spill were just lumps, indistinguishable from the clumps of oil beginning to join hands along the entire coast. 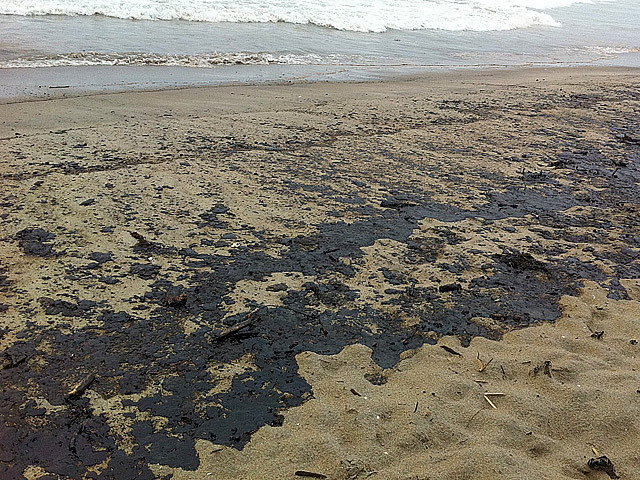 The first spill was hydraulic oil, thin and appearing as a sheen on top of the water, once it hit the sand it soaked straight in. 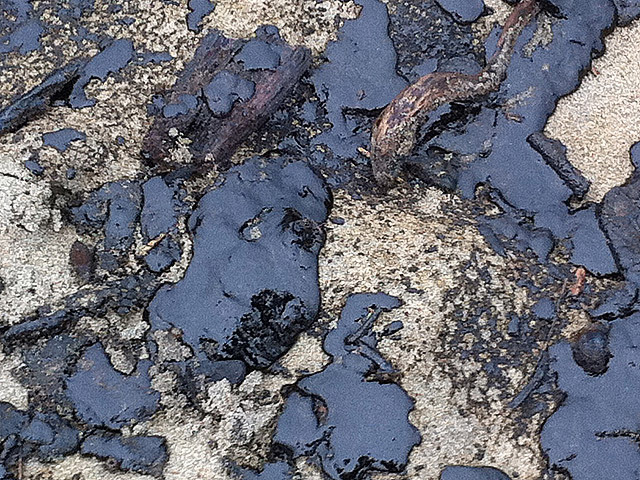 Next come the bunker oil, thick and gooey, to me it looks and feels like the tar used to seal roads, its so thick that ships like the Rena need to heat this fuel oil on-board to enable it to flow and burn. For the next couple of days it remained on the sand in fist-sized clumps, locals were stunned by the lack of action and support, many descended on the beach with buckets and spades, filling plastic bags. For five days the only directive from authorities was to “stay off the beaches.” Eventually bobcats arrived to scoop up sand, larger diggers delved into deeper oil traps above the high-tide mark, a tractor towing a scraper followed, giant John Deere agricultural tractors with plastic lined trailers in tow carted the sand off the beach to waiting trucks. Rena carried about 1700 tonnes of fuel oil, to date almost 1000 tonnes have been salvaged, 300 plus tonnes have entered the ocean. With something approaching 1100 litres per tonne, this amounts to some 330,000 litres of oil, the possibility of the remaining 300 plus tonnes releasing a further 330,000 litres exists. At the end-of-the-day it is not a lack of initial containment or clean-up action that has laid locals low, it is the lack of effective preparation for such an incident, from Government organizations to Port Authority. 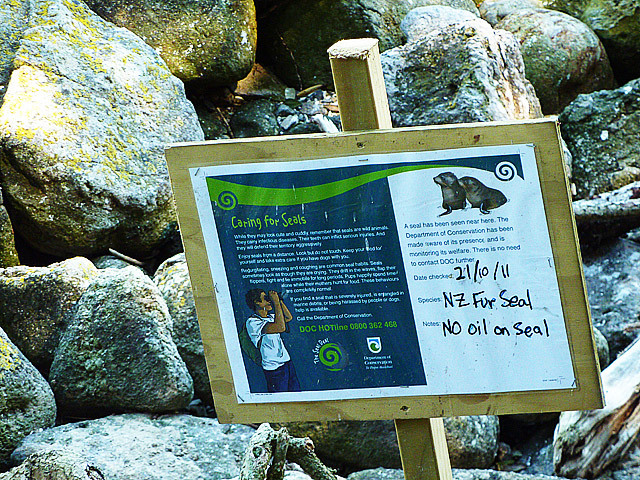 While every effort is being made to remove remaining oil from the Rena, no open-ocean capable booms are in place to provide containment around the Rena, nor providing protection around any part of the wildlife sanctuary Tuhua, the beaches of Motiti, Rabbit Island (within swimming distance from the Mount’s Main Beach) or Maoua with its myriad of rock-pools, nor the tidal flats of the inner harbour. While I acknowledge this would amount to many kilometres of booms, shouldn’t we have some on hand? 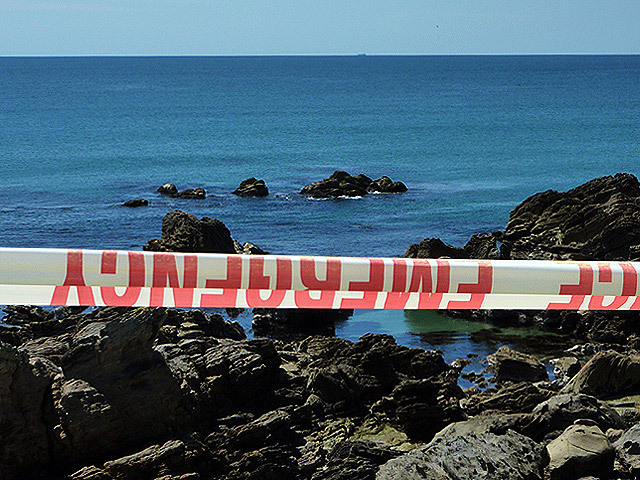 I do not accept that the Rena itself could not have been ringed, nor do I accept the Maritime New Zealand spokes-person’s statement that such action is pointless as it would only provide containment to around 10 % of the oil – not when 10% amounts to tonnes of oil. From my parent’s house, Motiti Island has been our anchor, the first thing we see in the morning, its eastern lighthouse, blinking twice – a second apart every six seconds – the last sight at night. I have been lucky enough in my late teens to visit the island, the most leisurely summer days imaginable. 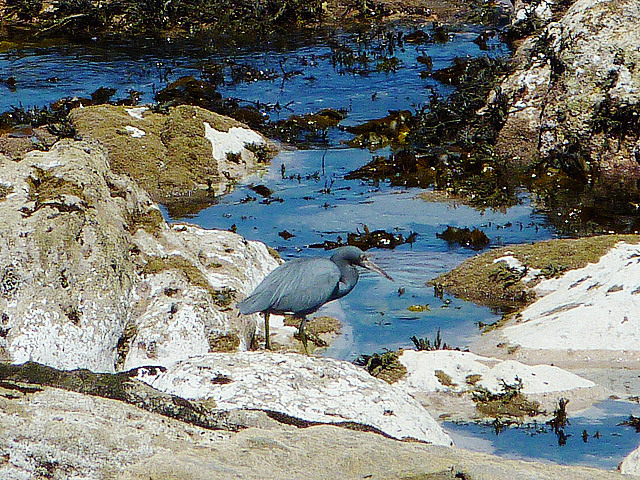 With temperatures always higher than the mainland, steaming afternoons are best spent wallowing in the shallows. 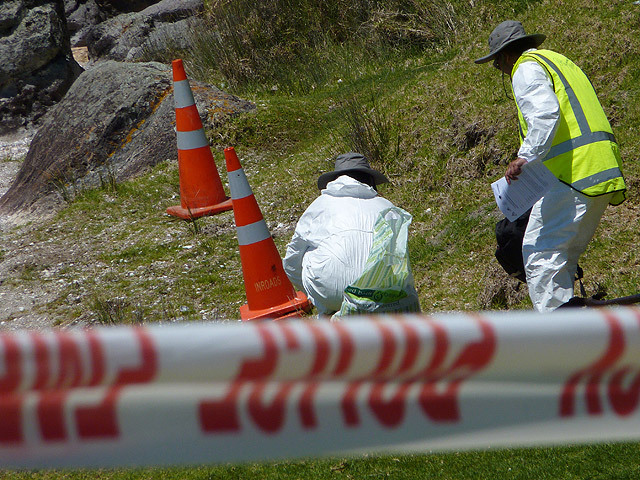 Crayfish are picked from under rocky shelves in chest-high, emerald tinted water, flickering to blue in the shadow of overhanging Pohutakawa trees. A billy hangs over a driftwood-fueled fire, filled with local red-skinned, pink-fleshed potatoes, crayfish wait in another. To follow, fat round watermelon, their dappled lime green skin split to reveal a collapsing magenta flesh. To the port, shareholders, shipping companies, and Government authorities, it is time for resources and policy to be in place to ensure future negligence is thwarted, accidents avoided, so when the odds are against us, we are ready. 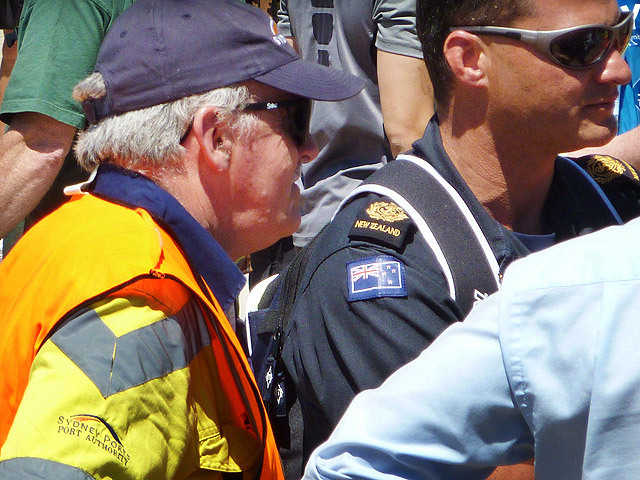 Last week at the beach-side response headquarters I saw representatives from the Sydney Port Authority and the Australian Marine Oil Spill Centre working side by side with the New Zealand Army, Navy, Police, local lifeguards and of course volunteers by the bucket-full. Thanks to you all. Kia Kaha. 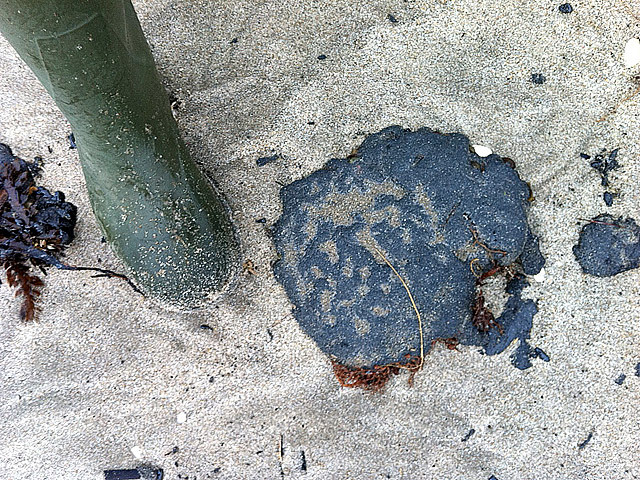 This entry was posted in Signs of Life and tagged Bay of Plenty, Motiti Island, Mount Maunganui, New Zealand, Papamoa Beach, Rena oil spill, Rena shipwreck. Bookmark the permalink. 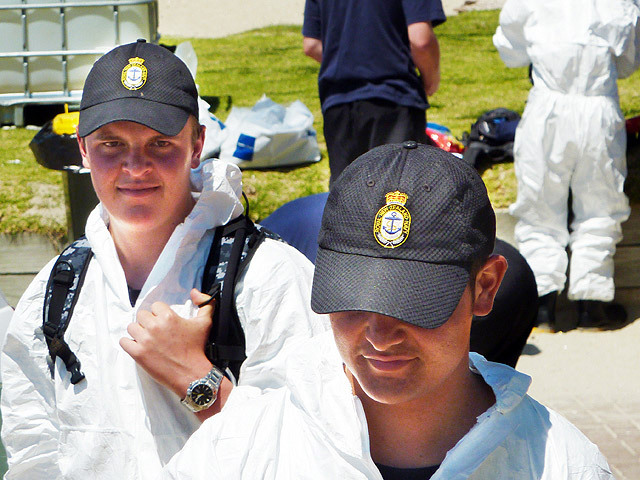 Great photos and interesting… after I stopped laughing at the description of Papamoa as the hub of the Bay of Plenty! Thanks Ngaire… I meant kind of in the middle of that great big ark… maybe I should have said that! However it was my social hub for many years!